As part of the Southern California Wildfire Risk Scenario Project, the U.S. Geological Survey released a short film addressing the containment of Southern California’s high volume of wildfires. 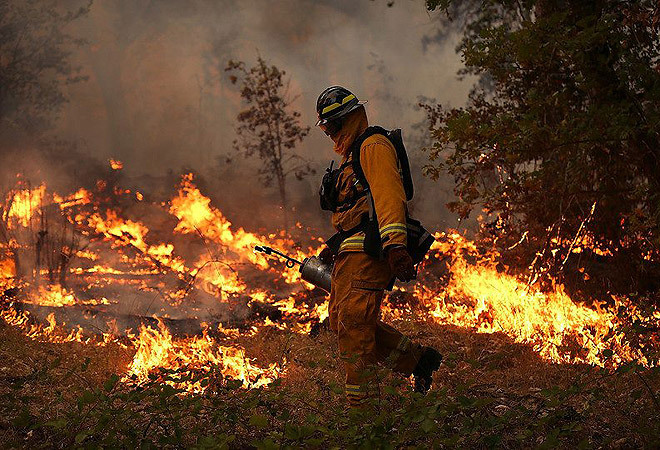 The video grapples with topics such as the loss of at least 1000 homes per year since 2000 (up from 500 in 1950) regardless of fire suppression efforts, the effectiveness of controlled burns (purposeful fires set during cooler months that manage fuel buildup and decrease the likelihood of more serious fires), and the factors that drive SoCal’s fire risk and ecology. More than that, it puts forth new and counterintuitive methods that may in fact deal with wildfires in a more effective way. USGS Fire Ecologist and co-founder of the risk scenario project Jon Keeley believes we need to change the way we look at fires, pointing out that our specific weather conditions will inevitably cause annual blazes, no matter how many precautions are taken. “Nobody talks about trying to stop earthquakes,” he says in the film. “Wildfires require the same sort of approach.” Even so, the film points out that 95% of fires are caused by human activity. Instead of focusing on prevention, ecologists are studying the risk factors involved in handling fires that have gotten of control. While this research continues, the Los Angeles Fire Department is doing all it can to be prepared for this year’s fire season: In addition to bolstering our wildfire response team with two super scooper airplanes and a Helitanker that flew in early from Canada, the department has released a new fire safety plan called Ready, Set, Go!, which provides a platform for residents to discuss their own preparation tips. Peruse USGS’ research, watch the YouTube video, but above all, Angelenos, stay safe.